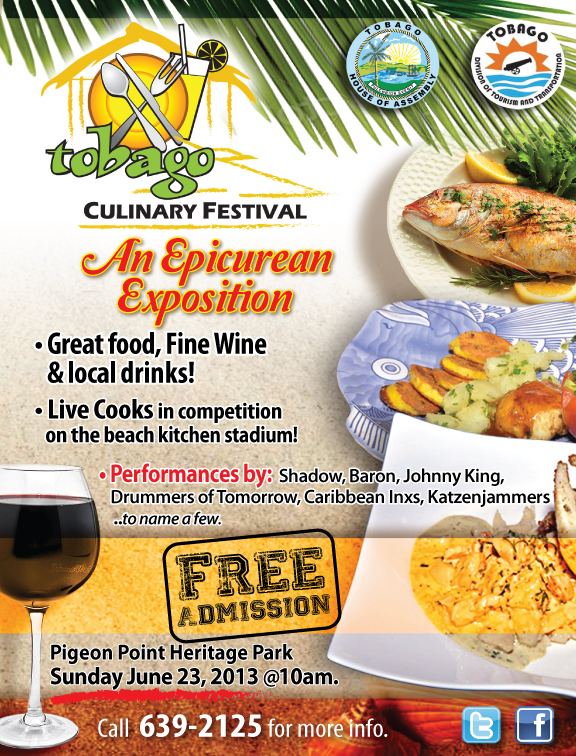 The 2013 Tobago Culinary Festival is back this weekend at the Pigeon Point Heritage Park! Entertainment includes commentary from Wendell Etienne along with musicians like Shadow, Baron Johnny King, Drummers of Tomorrow, Caribbean Inxs, Katzenjammers, and more! CONTACT – www.visittobago.gov.tt; contact@visittobago.gov.tt; (868) 639-2125, ext. 2219. Tags: Tobago Culinary Events, Tobago Culinary Festival. Bookmark the permalink. Looking forward to photos from 2013. I guess I’ll have to make plans to be in Tobago for 2014 GOD willing. In the meantime, get some of the products over here. I am just viewing photos of the 2012. Why aren’t these packaged items sold in Trinidad like the goat cheeses etc from Orange Hill Dairy Farm; the wines; Teas etc. All you see is TOO MUCH foreign stuff with a set of additives/preservatives, when so much local things are produced right here in Tobago, even organic, with local ingredients…..why…why…why??????? ?